Well dagnabit! It looks like Bertie led me astray for the tea party this week! She told me we were bringing grapes to today’s party. We had so much fun making that video with Lucy! Now, we’re off to the Galapogos Islands to join the other tea partiers, riding giant tortoises and flingin’ grapes (and shoes) today! We hope you’ll come join us! See that button covered in fine yarn in the upper left corner? It is a button I discovered in an old sewing basket that had belonged to my mother-in-law. I found the basket in my closet. This part of my card is for an Inspiration challenge on Stamp TV. I added a purple rhinestone to the center of it. After I colored and cut out my grapes, I stamped the image in Versamark and heat embossed with Glassy Glaze for a richer, shinier color. sounds like you got a busy day on that island. sure hope the wine is ready by the time you get back - lol! gorgeous card and fabulous button! 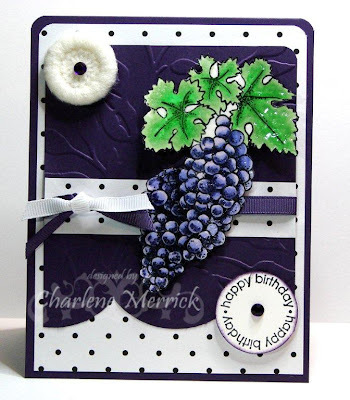 those grapes look like I can just pluck them off the card Charlene! super coloring on them - love the dark purples on this - and hey - anything goes for Teapot Tuesday - even if you get led down the wrong path!!! LOL!!! Love your card! Thanks for the great trip down memory lane! 'I Love Lucy' was my most favorite show as a kid. I remember the episode well. And thanks for the tip about the peanut bars. Good to know they store well in the freezer. I jes luv da kulors on dis buty (az I no u due 2)....an' yer tidal jes maid me laff...u punnee girl.....aisle stomp dem graips wit ya anee daigh. Hey, some of us are flat footed like FFBR..it is one of life's cruel, cruel jokes for floosies who love little strappy trampy sandals. Ah well...if not for our FF, all those lovely grapes would have gone to waste or waist. At any rate, those are some yummy looking grapes you've picked and that button is to die for! What a treasure. Peanut bars...I missed those. I'll swap some of those lovely looking grapes for some of my fruit cake any day. I am glad you brought something like that along to the party - and of course Ruby's big flat feet would be perfect for treading the grapes. Love that button, too! !